Adjusting entry doors is not that difficult. Most of the time the door is sagging and an adjustment to the top hinge will solve the problem. Often, you will see that the door on the hinge side is tighter against the frame at the bottom of the door. This is where most of the weight of the door is pushing against. When this happens the gap at the top will be uneven, wider at the strike side of the door. The top of the door will be closer to the jamb or frame at the top. If the door is tight against the frame at the top and there is a gap at the bottom, the door is sagging. If the door is hitting the sill, it will still be indicated in the margin along the latch side. Is the gap wider at the bottom and narrower at the top? Yes, then the door is sagging. The sill is keeping it from sagging as much as it wants to. Sagging doors are the problem most of the time. The weight of the door pulls against the top hinge and over time the door will sag. This is especially true when the screws for the top hinge are not long enough to go into the door frame. 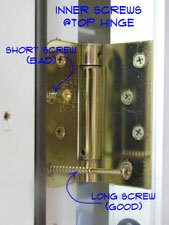 A sagging door will also cause problems with the door locks and dead bolts. If the door sags too much the latches will not work correctly. Before you start replacing hardware, or moving the strike plates, make sure the door is properly adjusted in the frame. See the article on 'Adjusting Door Lock Strike Plates' and 'Aligning Doors to Strike Plates' for more information. Open the door back up and remove the two inner screws for the top hinge. How long are they? An inch or less? This means that the hinge is only being supported by the door jamb itself, not the framing lumber for the wall. Are the screws long, say 2 ½ to 3 inches. That's good, all you will need to do is tighten them up. Adjusting entry doors could be that easy. If you have long screws, make sure the heads are not stripped. For short screws you need to obtain some 3” number 8 screws. Square or Torx drive are better, but phillips head will work. Install the long screws, angling them slightly toward the center of the jamb. Snug them up and then check the margins again. Still sagging? Tighten them a quarter turn at a time until the margins are even and the door closes properly. More is not better in this situation. If you over tighten the door will bind in another direction and you will have to start over on your adjusting entry doors project. Tighten until the margins are even and the door closes easily and then stop. With the long screws in place you may have to snug them a little from time to time. Five minutes now that you know how. Door closes, Great! Go to the next project on your list. It is possible that the door could be binding in another spot. The door may be tight against the bottom of the jamb. This is more likely due to a door jamb that is out of alignment. See the article on 'Fixing Door Jambs' for information on what can be done with the jamb. A long screw per the procedure above could be used to draw up the lower hinge. It is rare that this would need to be done, so use caution when trying to adjust the lower hinge. Tightening it could make the top of the door go out of alignment again. 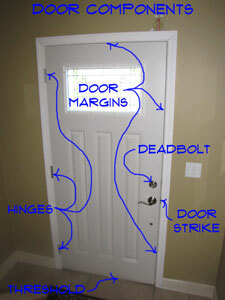 Many of the problems you will have with exterior doors can be corrected by getting the door properly aligned. From the above, you have learned that most of the alignment or adjustment issues are related to the top hinge. Securing and adjusting the top hinge is not difficult, once you have the right fasteners and tools.